My best friend suggested derby. I needed an outlet that was aggressive and unique like myself. She was a skater and knew that I would fall in love. I enjoy getting tattooed in the most painful spots possible. My armpits by far have been the worst. I also really enjoy hot yoga. My husband and our 3 boys. They see me as a super mom when in reality, they’re the superheros for putting up with my crazy self. They’re the biggest reason I wake up everyday. All through school I ran track and cross country along with playing softball. Prior to skating for OHRD I spent a year skating with Roundtown Roller Derby in Circleville, OH. My husband named me. At the time I started, I was a blue-haired, minivan-driving, travel team soccer mom! My family stuck out like a sore thumb at games and I loved it. There’s no reason to live a cookie cutter life. Pre: Being manic and spending way too much time fiddling with my knee pads. Post: Eating as many BBQ chicken wings as possible. Being very squirrelly while jamming. 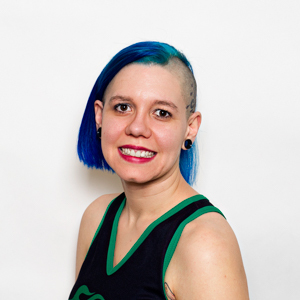 Roller derby has genuinely saved my life. As a mom of 3 special needs boys, I was consumed in making sure I did everything possible to advocate and raise my boys. I had forgotten about taking care of myself. Derby has given me something that is just mine, my own challenges and goals. It’s helped me become a better mother and keeps me sane. I have been dyeing my hair blue for over 3 years now and have no plans to stop. Life is too short to have a natural hair color!